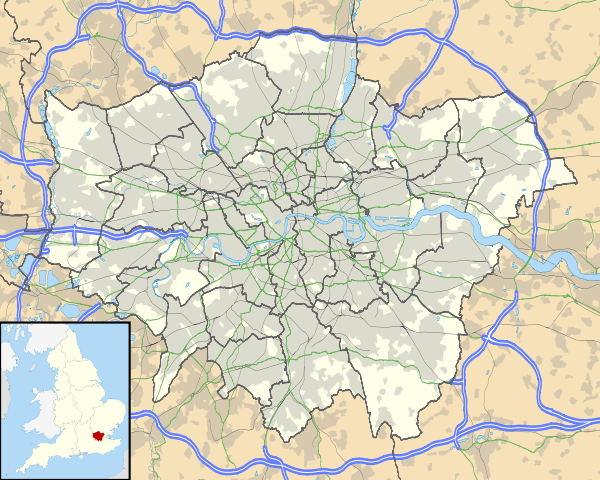 Fulwell is in the London Borough of Richmond upon Thames between Twickenham, Teddington and Hampton Hill. The name is first mentioned c. 1450 and probably derives from Full or Foul Well. The Royal Mail no longer recognises Fulwell as a place name – it survives or exists as part of two street names and in the names of Fulwell railway station, Fulwell Golf Course, Fulwell bus garage and often on warding (electoral division) as Fulwell and Hampton Hill ward. The largely residential area has an Anglican church, St Michael's, a combined parish with St Peter & St Paul, Teddington. Historically Fulwell formed the southern extent of Hounslow Heath and the underlying Taplow gravel that defined it. A reference to assarts at Fulwell dating from around 1200 are amongst the earliest records of the name. The area was progressively enclosed for agriculture and increasingly urbanised since the Victorian period of metropolitan expansion of outer London. To the west of the common land and to the north of the Staines Road south-west of Twickenham stood a house; Fulwell Lodge. Formerly known as Yorke Farm it dated from the early 17th century. In 1871 Charles James Freake, a London property developer, purchased Fulwell Lodge and the surrounding estate. The boundary extended south from the A316 Chertsey Road and River Crane, included Twickenham Green and what became Strawberry Hill Golf Course, the area west along the Shepperton Branch Line encompassing what is now Fulwell Golf Course and returned north along the A312 Uxbridge Road to the A316. Freake named the area Fulwell Park. After Freake's death in 1884 the estate passed to his wife and, on her death in 1900, was held by Freake Estates until 1910. The exiled King Manuel II of Portugal acquired the estate and lived at Fulwell Lodge from after his marriage in 1913 until his death in 1932. The lodge was subsequently purchased by Wates, demolished and the surrounding land between the Staines Road and River Crane redeveloped for housing. The Portuguese connection was marked in road names such as Manoel Road, Lisbon Avenue, Augusta Road and Portugal Gardens. ↑ "Richmond Ward population 2011". Neighbourhood Statistics. Office for National Statistics. Retrieved 11 October 2016. ↑ "St. Peter and St. Paul, Teddington and St. Michael and St. George Fulwell". The Church of England. Retrieved 4 June 2015. ↑ Reynolds, Susan, ed. (1962). "Heston and Isleworth: Hounslow Heath". A History of the County of Middlesex: Volume 3: Shepperton, Staines, Stanwell, Sunbury, Teddington, Heston and Isleworth, Twickenham, Cowley, Cranford, West Drayton, Greenford, Hanwell, Harefield and Harlington. Institute of Historical Research. pp. 94–96. Retrieved 26 November 2014. 1 2 "Fulwell Lodge". Twickenham Museum. Retrieved 24 November 2014. ↑ Reynolds, Susan, ed. (1962). "Twickenham: Introduction". A History of the County of Middlesex: Volume 3: Shepperton, Staines, Stanwell, Sunbury, Teddington, Heston and Isleworth, Twickenham, Cowley, Cranford, West Drayton, Greenford, Hanwell, Harefield and Harlington. Institute of Historical Research. pp. 139–147. Retrieved 25 November 2014. ↑ Watson, Martin. "Fulwell Park". Retrieved 24 November 2014. ↑ "Other Major Houses in Twickenham & Whitton". Twickenham Museum. Retrieved 24 November 2014.